Pongal provides an ideal location for your corporate, church or organization meeting. Our event venue provides ample space to host large groups and allows you to customize the space and the accommodations. Why Choose Us for Your Meeting Hall? We provide the furnishings you need as well as AV equipment. 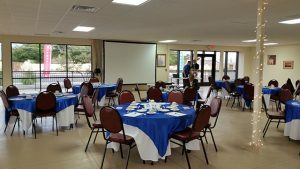 We offer competitive packages to make meeting hall rental affordable for your business or organization. Our wide-open space can be set up to provide theater seating or table rows, facilitate small groups or break-out sessions. If your meeting requires re-arrangement during your event, please speak to our event coordinator. You are free to select your caterer (and other service providers) to provide snacks, meals and beverages or other services for your meeting attendees. Our event coordinator and/or event planner can provide recommendations for local companies with excellent reputations if needed. Additional time before your scheduled event is available to set out information packets, etc. before attendees arrive. Pongal Event Center offers excellent rates for weekday and/or business-hours events. Contact us to book your meeting in our hall. If you would like assistance coordinating food and beverage service (and more), please contact Elaine, our event planner, for packages and pricing. Pongal Event Center provides an ideal meeting hall for your business or organization functions. Call us at 505.892.5022 to book your event today!